Fishing With Flies :: Blog: A strategy for finicky panfish during the "dog days of summer"
A strategy for finicky panfish during the "dog days of summer"
I heard on the evening news last night that this has been the warmest first six months of the year (overall, for the entire country) in history. Since we don't have central air-conditioning at our house, we have been suffering these last few weeks. I don't think the fish like it either. Locally there's not a chance that I will fish for trout. Some will find underground springs to help them holdover, but my guess is that a lot will die off. So, I fished again today from my floattube for bass and panfish. But the fishing on my favorite farm pond was as slow as I have ever seen it. 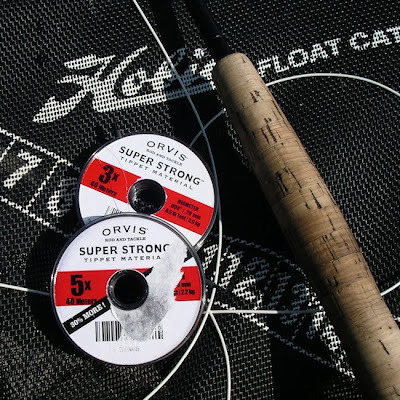 I fished the first 30 minutes without any action, trying topwater poppers and hoppers and gradually fishing deeper and deeper. Nothing. Thinking about what other strategy I could try, I felt a need to fish something smaller and deeper. If I had some really heavily weighted small nymphs I would have tried them. Something like a Copper John would have been excellent. But, sometimes the best strategy for getting small nymphs down deep without adding more weight is to make adjustments to your leader. I was fishing my standard panfish leader: A 6 foot tapered leader with about 2 feet of tippet added. That usually means a 3x tippet as that nicely turns over the poppers and buggers. To get deeper, I added about 3 feet of 5x tippet to the 2 feet of 3x tippet to create a 10 1/2 foot leader. I attached a beadhead and went to work. The 5x tippet material helped the beadhead sink because its thinner diameter sliced and sank through the water better. It also placed the fly further from the end of the floating fly line. Once the fly is down deep, it is important to move the beadhead only slightly because when you strip the line the beadhead will move up in the water column, and away from the fish. This worked great. I kept the line barely taught and waited for the subtle "tap, tap, tap". The first beadhead was a size 12 herl body nymph with a short tail of rabbit fur. Basically, my "Hare & Herl Bugger" without the hackle. 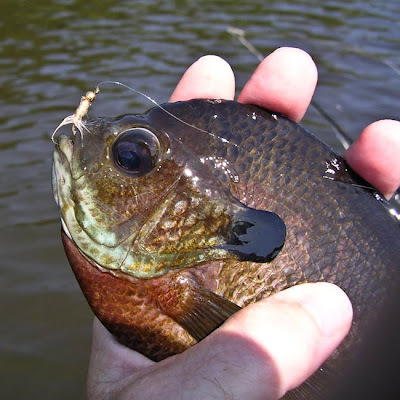 I managed to catch some big bluegills, and I also managed to loose a couple of fish that got wrapped around lily pads or underwater structures. With 3x I can usually coax them toward me, but 5x is a different story. I then moved to an even smaller nymph. Probably a 14, but it had no tail. Just a bead head, white wool body and a couple of wraps of white hackle tied aft, rather than in front. Little white grubs like this work well for me during the summer. I find this interesting because usually I find dark colors better. To really change things up, try a white grub on a scud hook. This gives the nymph a little wiggle. 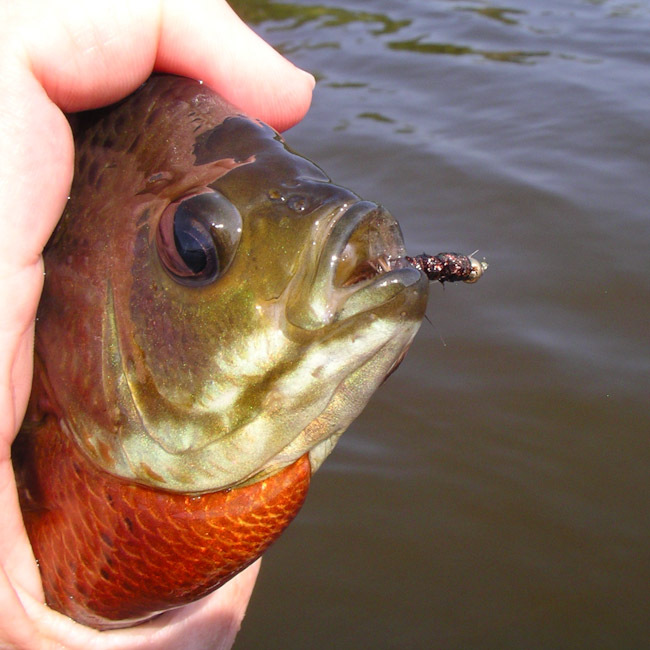 Unfortunately, the scud hook grub was another fly I was without today. I would have tried it next. 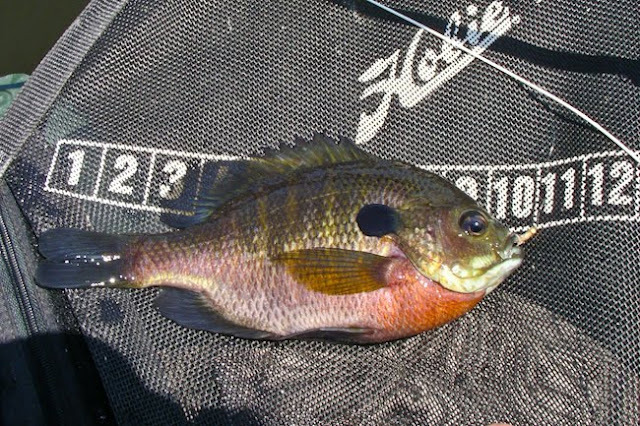 Below is a picture of what was perhaps the largest (almost 10") bluegill of the day, followed by the largest (and only) Pumpkinseed. 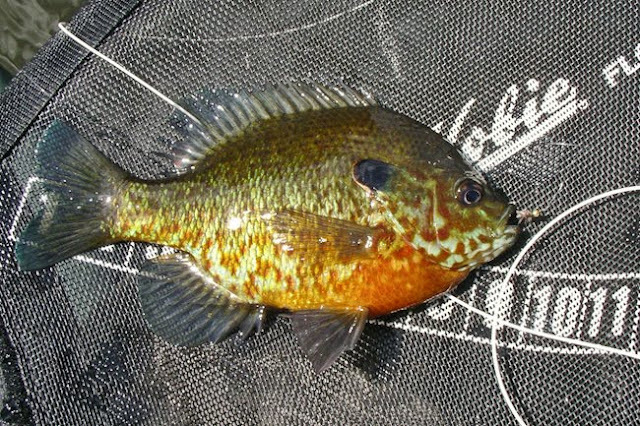 Pumpkinseeds don't get quite as large as bluegills. At nearly 9" this was a big one. First outing at the "Land of the Nuclear Sunfish"